The Suffolk Balance Board is an excellent tool to improve a dancer’s core strength and stability. 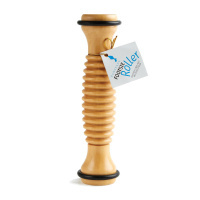 It is perfect for exercising the leg muscles, developing the joints in the foot, ankle, and hip areas, and enhancing overall balance. The upper board is constructed from a high quality wood with a non-slip surface, while the lower balance dome is made with a very durable and long-lasting high-performance polymer. Unlike other balance boards on the market, the dome height of this product was specifically engineered for dancers and the exercises and positions they perform. The Balance Board is also an effective tool to use after an injury, providing no-impact exercises to help boost rehabilitation and reduce the risk of re-injury. The Suffolk Balance Board measures 16" in diameter.